Nancy Hopkins Tier, Robinson "Robbie Risner, Robert L. "Bob" Scott, Theodore "T.A." Petras, Evgeny G. Pepelyaev, William W. "Bill" Spruance, Joe H. Engle, Lee A. 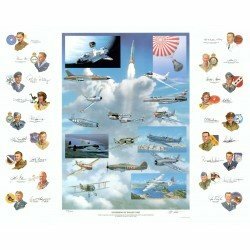 "Buddy" Archer, JR., Francis S. "Gabby" Gabreski, Thomas W. Ferebee, John H. Glenn, Jr., Walter Krupinski, Hugh L. Mills., Jr., Theodore "Dutch" Van Kirk, Eugene A. "Gene" Cernan, John F. "Jack" Bolt, Lloyd W. "Fig" Newton, Saburo Sakai, A.W. "Bill" Bedford - and one additional WWII P-51 Ace and well known test pilot.